What's Going On? 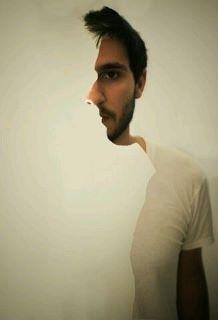 The human mind will correct this image such that the man’s face will appear…sideways. Notice the shape of the cut through the image. How does that influence your brain's interpretation of the photograph? Want to make amazing paper snowflakes? Here's how! DRAW A STICKMAN; and have an adventure! WATCH LIGHT IMAGED AT ONE TRILLIONTH OF A SECOND!